Are you ready, ladies? The dreamiest guy in all of MMA (so I hear) is about to return to action. On Tuesday morning, officials announced former Strikeforce middleweight champion Luke Rockhold (pictured) will battle Tim Boetsch at UFC 172. The April 26 event takes place inside Baltimore Arena in Baltimore, Maryland. 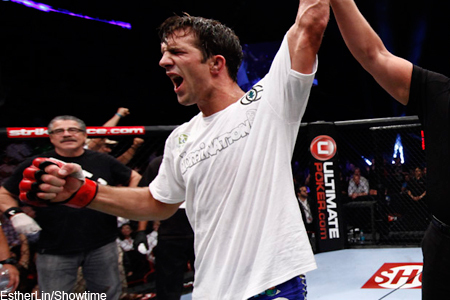 Rockhold will be making a quick turnaround from January’s knockout victory over Costas Philippou. The bout marked Rockhold’s first UFC win, as he was KO’d by Vitor Belfort in highlight reel fashion in his big league debut. Boetsch collected a much-needed win with a split decision over C.B. Dollaway in his last outing. “The Barbarian” had dropped two straight bouts prior to October’s tango.